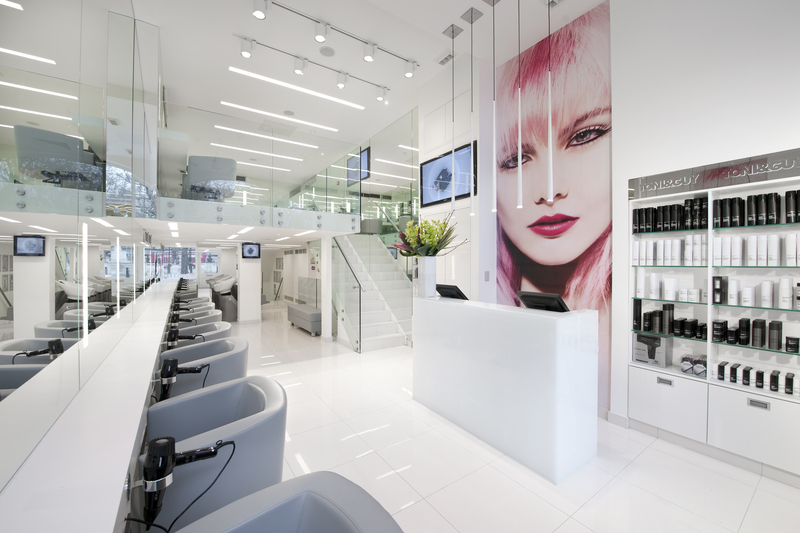 TONI&GUY Sloane Square opened in the city centre in 1982. As a salon we pride ourselves on delivering the highest standards of customer service to each and every client. Members of our salon are part of the TONI&GUY Session Team and have worked alongside the International Artistic Team on catwalk shows at London Fashion Week, bringing the latest trends from the catwalk to our clients. Members of our Colour team hold the prestigious L’Oreal Colour Degree- their knowledge and expertise are on hand to advise you on the latest colours and techniques. Members of our Colour team hold the prestigious Wella Master Colour Expert accolade- their knowledge and expertise are on hand to advise you on the latest colours and techniques. We offer many additional services including Bridal and Occasion hair and the NanoKeratin Smoothing blow-dry. Our wide range of haircare products include label.m, Kerastase, GHD, L’Oreal, Tangle Teezer and TONI&GUY to keep your hair salon perfect until your next visit. Julian is such a superb stylist. Perfect cut every time, thank you! And I really enjoy coming to this salon as they always deliver friendly and professional service! Amber has been doing my highlights for many years and she always does a really good job. I was very happy with the results today! She knows my colour and what I want and does it very well. Thank you for your feedback Kirsty! We look forward to seeing you in the salon again! Kaz has been cutting my hair for more than 10 years now. She is excellent and for me the best stylist I have at Toni and Guys. Thank you for your feedback, Jackie! I'll pass on your compliments to Kaz and we look forward to seeing you again soon! Kaz is the consummate professional. She always gets it right with self deprecating skill. Everyone working there is really nice and standards are high. Thank you for your feedback Anne, I will pass on your compliments to Kaz! She also gave me a dirty apron which had hair and a stain on it like it was just previously used. I didn’t understand the animosity. In contrast, the young woman who washed my hair was very nice, very professional and did not have any attitude. Did her job well and treated me with dignity. Massimo was very nice, very professional and attentive, listened to me and did a great job on my hair and cut it to the length I asked him too. He was pleasant and did things with a smile and made me feel at ease. The woman at reception who took my payment was also nice. First of all may I apologise for the late response to your review of the salon. I am extremely disappointed that you were not welcomed upon your arrival at the salon to the standard that is expected of our reception team , please be assured I have spoken to the front of house team and this will not happen again in the future . Hi Noola, we appreciate you reviewing us and we are glad to hear you had a good visit to our salon! We shall see you again soon! Philipp is wonderful - such a pro and just so lovely. He’s always done an amazing job with my hair no matter what style and I’ve never had as good a cut anywhere else. I always leave feeling great! I can’t recommend Philipp and T&G Sloane Square more! Thank you so much for taking the time to review us Holly, we will be sure to pass this on to Philipp and its always great to hear our clients are getting an amazing service. We look forward to seeing you again in the salon! Philip is very expert and reliable. I have previously had good haircuts also from Kaz and Massimo. Clients of all ages and nationalities. Service is always very good. It’s better to avoid Saturdays if possible as it gets busy. They are open late in the week. Thank you for taking the time to review us Nigel, we really appreciate your feedback! It's great to hear you've had a good service with our stylists and we will you see you again for your next haircut soon. Hi Clare, thank you for reviewing us, we are glad you had a good visit to our salon and look forward to your next visit! Thank you for your review Alex, we pass this on to Brandon and look forward to your next visit to the salon! As always, the staff were friendly, knowledgable and professional. Amber showed great attention to detail and coloured my hair perfectly. Thank you so much for your feedback, Natasha! We look forward to seeing you again soon! Massimo cut my son hair and has been fantastic as usual. Great new look! We're so thrilled to hear your feedback for Massimo! See you soon! Miriam was very knowledgable and very friendly stylist! I had a great experience with my hair colour with her. I’d be sure to go back to her for colour! I will pass your compliments onto Miriam, many thanks! It's so great to hear you had an enjoyable salon experience! Brandon always makes me smile with his chats and anecdotes. Always great service. Brandon's fantastic, isn't he?! Many thanks for your feedback! Another brilliant haircut from Francesco and grey blended away by Miriam. Great salon and great team. Hi Simon, it was our pleasure, see you again soon from Team Sloane Square! Francesco is a fantastic hairdresser and a very good egg! Hi Hugh, that's great to hear and we will be sure to pass this on to Francesco! We look forward to your next visit with us in the salon. Many thanks. Had a lovely experience with clair, she Knows what she is doing. Thank you for taking the time to review us and we hope to see you in the salon again! We will be sure to pass this on to clare.